To commemorate winners of the Grinnell Prize, the College commissions paintings by artist Tilly Woodward. She says "It is both an honor and a privilege to paint the story of people who have done so much in their young lives. I enjoy the challenge of finding visual metaphors to represent their missions and the enormous impact of the work they do with and for others." Learn more about each year's paintings from her below. Statistics show that nearly one in two black women have a family member in prison. These women often experience isolation, face stigma and care for children and finances on their own. Essie Justice works to connect women with incarcerated loved ones to give and receive support, and empowers them to network, heal, and create social change to end mass incarceration. Through Essie programs, women teach each other to be leaders and advocates. This painting depicts the hands of two women supporting and holding each other up, and holding up the future, represented by the hand of the child. The hands are posed in a triangular configuration, a shape of strength, and at the same time they are nestled and tender. The painting also talks about barriers, both obvious and subtle. 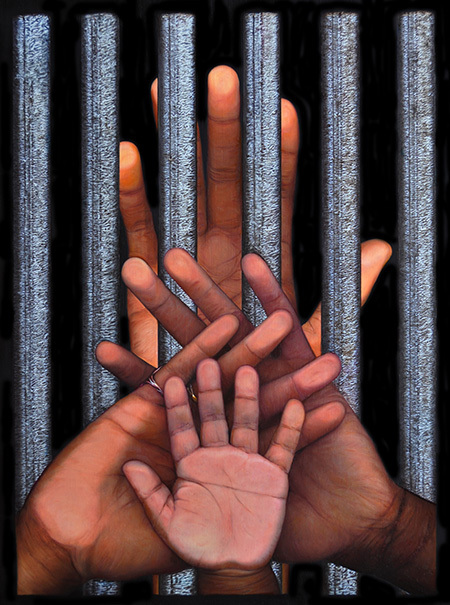 There are the prison bars, which separate the hand of the incarcerated family member from the women and child; the black border around the edge of the painting, representing containment and isolation; and an invisible barrier that the hands press up against, representing the impact of profiling and mass incarceration. Many thanks to hand models Tiana Jones, Grace McKendall, Little Hassan, J’remi Barnes, and Jamal Preston. Adhikaar is a multifaceted organization that works for human rights and social justice, serving Nepalese immigrants through interactions that are personal and community-based, as well as helping to create public policy. 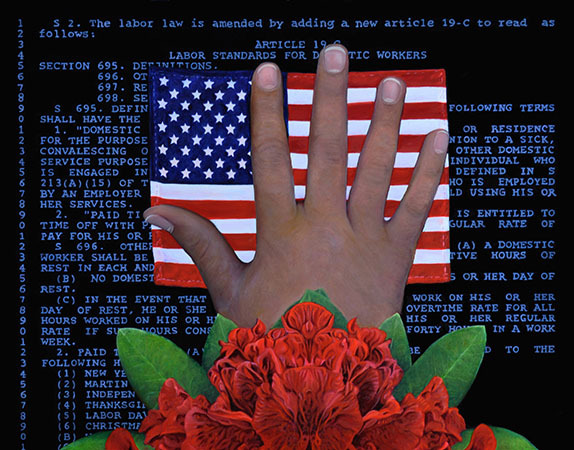 Nepal is represented by the mandala-like rhododendron at the bottom of the painting, and the experience of immigration is represented by the hand, a symbol of personal identity, emerging from the flower, reaching towards the United States flag. The hand also represents Adhikaar’s work to establish healthy conditions for nail salon workers, and the text in the background represents Adhikaar’s work to establish policy protecting the rights of domestic workers. Many thanks to hand model Anushka Joshi. Essmart connects consumers in remote communities, local mom and pop shops, and manufacturers of low cost, environmentally sound essential products like solar lights, water filters, and cook stoves. These products are life changing, but only if there is a sustainable system of distribution, which Essmart has been able to create. The solar light in the painting is a product available through Essmart, shown illuminating the hand of the person who is able to work or study after the sun has set. 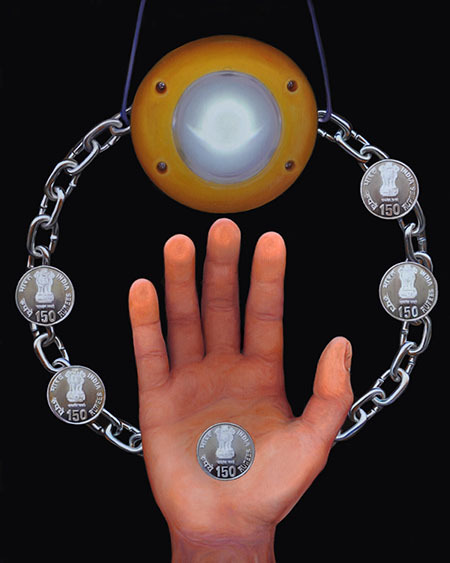 A “supply chain” connects the hand and the solar light, which is punctuated with Indian coins, representing the increased flow of commerce. Many thanks to hand model Medha Gopalaswamy. Engaging young readers through culturally relevant literature is at the heart of Golden Baobab’s mission. It’s important to see yourself reflected in your reading, especially when you are just starting out. This painting represents children’s books written for Africans by Africans. The pen, pencil and brush represent the authors and illustrators that Golden Baobab supports through competitions, prizes, publishing and distribution of books. The books are painted to look well-worn and well-used—beloved tales that open a world of imagination and learning to Africa’s children. For people who do not speak English and are in medical crisis, having a trained medical interpreter can be a matter of life and death. Found in Translations helps bilingual and homeless women secure meaningful jobs by providing training for medical interpretation certificates, and helping place them. This painting is about pairing multiple needs. Medical intervention is represented by the stethoscope and blood pressure gauge. The keys represent the stability of an income that provided keys to a home and other opportunities to bilingual and formerly homeless women. 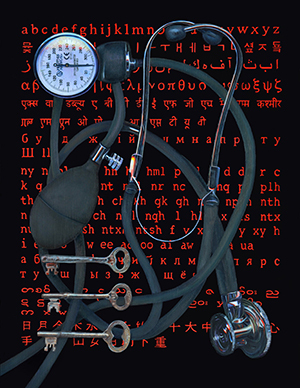 Interpretation is represented by the different alphabets and language systems, painted in red to represent medical crisis. Sanergy provides people living Kenya’s poorest slums with no running water access to clean, safe toilets, provides residents an important way to make a living, and transforms human waste to fertilizer, increasing agricultural output. In this painting waste is represented by flies. The coins represent the three-shilling fee slum residents pay to use a Sanergy toilet, and the earning potential of the residents who own Sanergy franchises. The young crops sprouting from the seeds rooted in the turnover of money and waste represent the top of the cycle that Sanergy creates in its multi-faceted endeavor. Sirum makes order out of chaos, providing life saving medicine that would otherwise to waste to people who can least afford it. 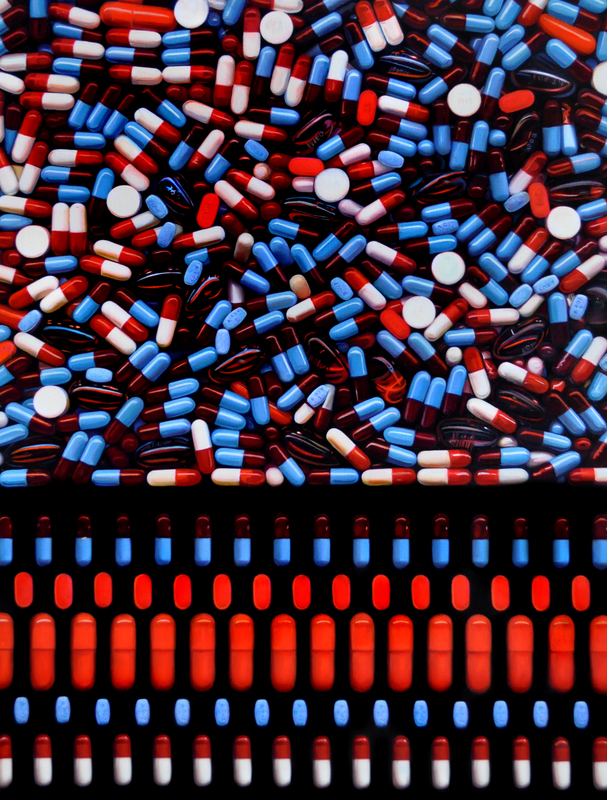 This jumble of pills becomes organized, manageable and most of all useful through their vision and work. Asylum Access empowers refugees through legal advocacy training, creating systemic change to guarantee refugee rights, including the right to work in countries of first refuge.By developing the Refugee Rights Toolkit, Asylum Access is able to replicate its model beyond the countries where it has offices. 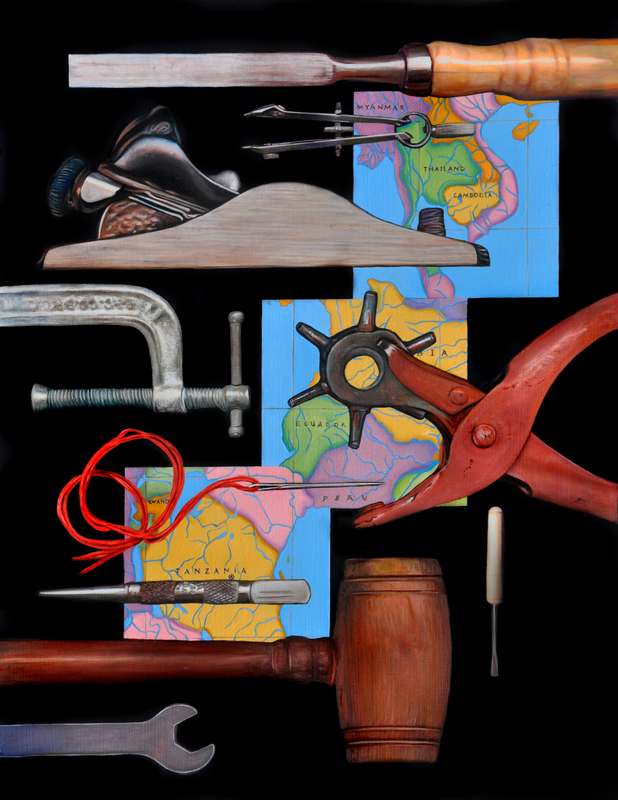 The tools in this painting include a plane, used to level wood, and a judge’s gavel, reflecting the impact of legal rights that smooth the playing field for refugees. The other tools are simple in nature — a needle and thread, a punch, a chisel, and a screwdriver — representing the significance of being able to work. The maps represent countries where Asylum Access set up its first offices: Tanzania, Ecuador, and Thailand. The moon and the red numbers in the painting for Sustainable Health Enterprises (SHE) represent the days of work and school that girls and women lose each year because they do not have access to affordable menstrual pads. Seen in relationship to the numbers 1-365, this visualization of the lost opportunities for learning and earning suggests the cycle of ignorance and poverty that often results. SHE provides women with the means to produce their own pads using natural resources (often banana fibers), resulting not only in dignity, but also in an ecologically sound, sustainable source of employment. 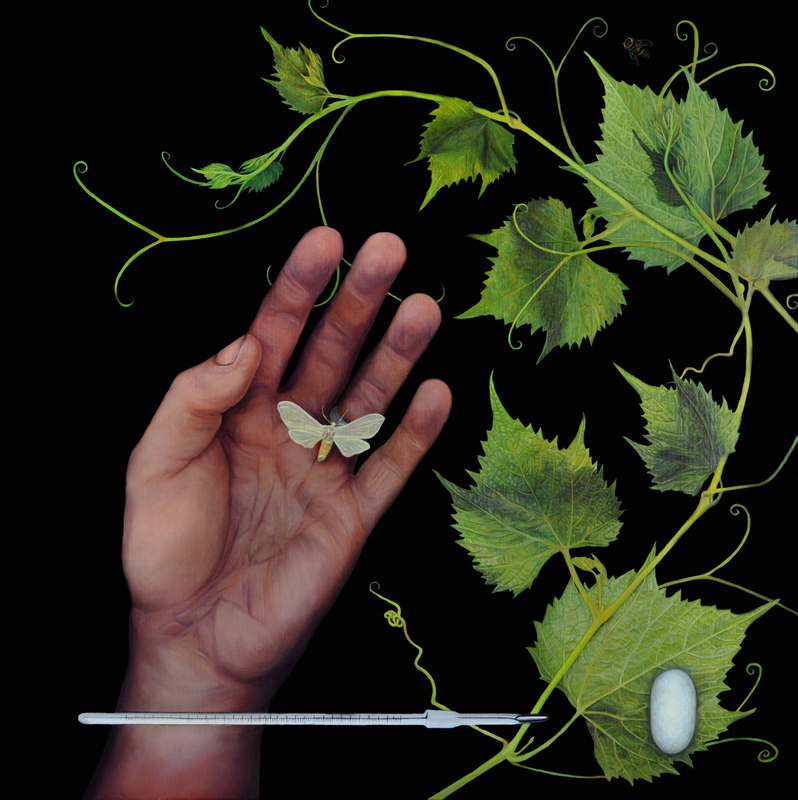 Transformation, connectedness, labor and gentleness are key concepts in the painting. Elements like the moth and cocoon represent all the winners’ work, while other elements are more specific. and the bee for the wax panel that holds and transfers the heat in the warmer without need for electricity. The grapevine represents the work of Cristi Hegranes with Global Press Institute as a growing, living thing: the power of the transmission of information from person to person as agent of change with global implications. I’ve painted many hands over the years. I think of them as the ultimate power tools. This one is extended, representing the work of Jacob Wood and William McNulty with Team Rubicon: ready to help and offer aid and care for others in dire circumstances. The hand is dirty with the patina of labor, but gentle and kind enough to hold and release a delicate winged creature. An Afghan war veteran and family friend Joe Gallagher was my hand model. 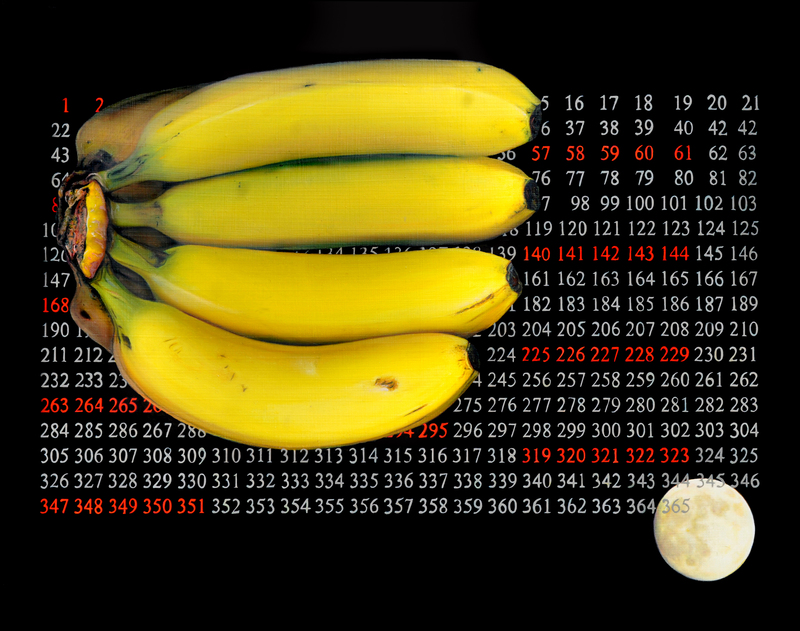 Eric W. Glustrom and Boris Bulayev, Educate! 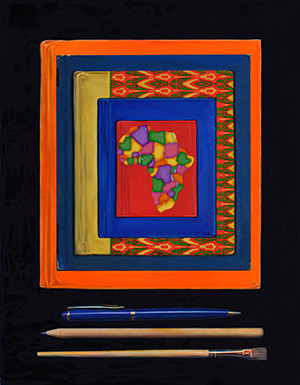 Mirror images of each other, these paintings refer to Educate!’s impact on Uganda. 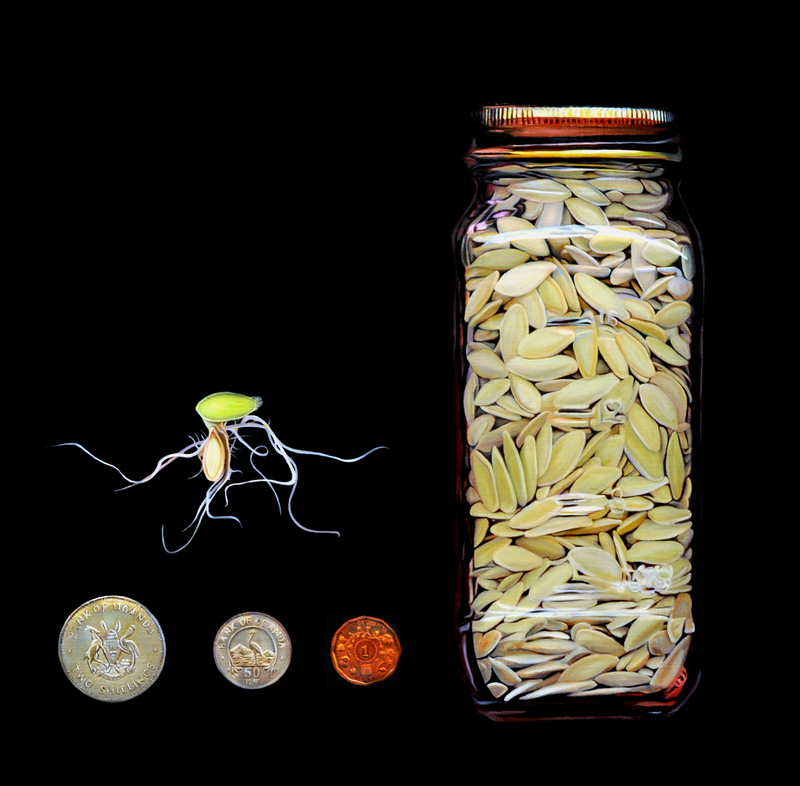 The single germinated seed represents the moment in which knowledge engages with a student’s mind and experience. The small coins represent the modest investment in education that can change young people’s lives and the lives of their families and communities. The jar represents a nation embracing the Educate! 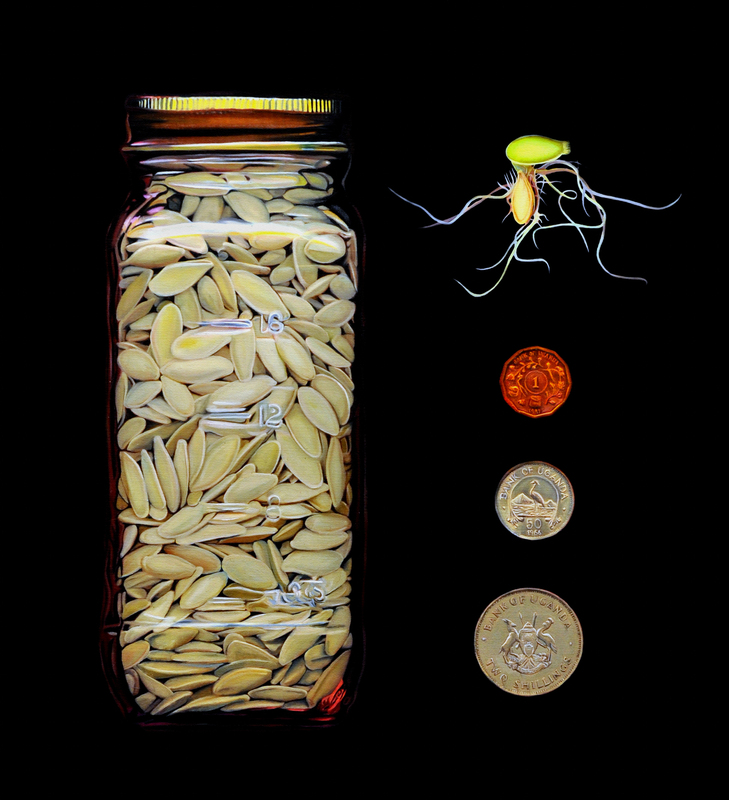 social entrepreneurship program; the seeds in the jar symbolize Educate!’s social entrepreneurship program reaching young minds throughout Uganda. 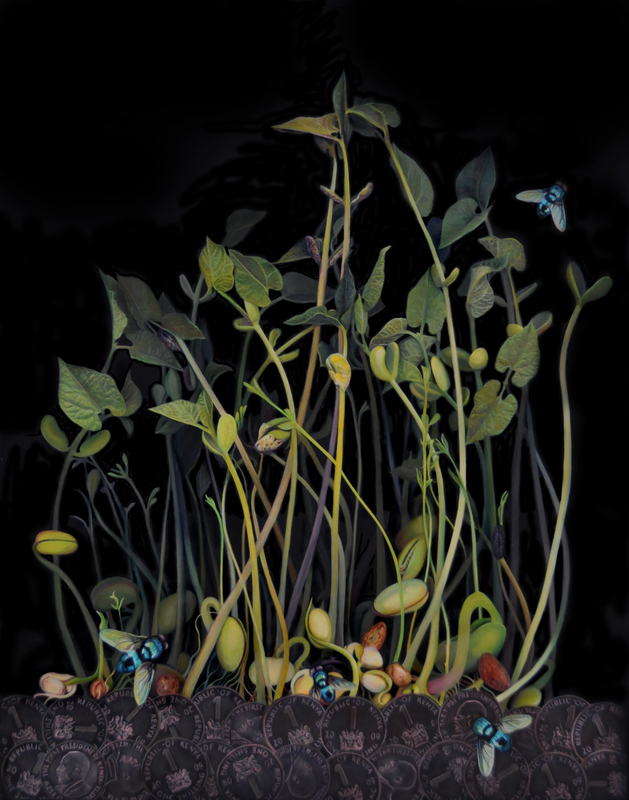 As each seed germinates, it produces new seeds. The result is a cycle of education, entrepreneurship, and sustainability that is virtually without limit. 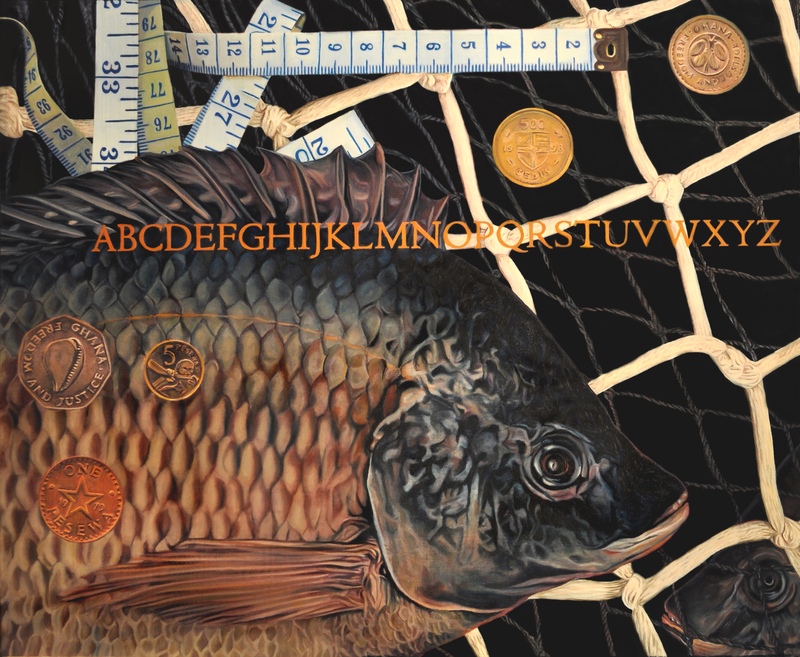 This painting represents Annan’s challenging and complicated life — from the tilapia found in Lake Volta, where James fished as a child slave, to the Ghanaian coins that represent the price traffickers paid to buy him from his parents. The coins also symbolize his rise from slavery to become a Barclays Bank manager and his financial investment in Challenging Heights. The younger of the two fish is caught within the netting (slavery), while the bigger fish swims outside the net (freedom). The alphabet represents learning to read and write from the books of kindergarteners, as well as the teaching that Annan now offers through schools he has opened. Numbers on the measuring tape also represent skills such as tailoring, taught in one of Challenging Heights’ many programs. Painting for Rabbi Melissa Weintraub focuses on seeing oneself through another’s lens. Woodward placed the Star of David atop the kaffiyeh headdress (Jewish and Palestinian symbols, respectively) to portray Rabbi Weintraub’s efforts to bring together the diverse perspectives of Israelites and Palestinians. The extended, open hand represents a peace offering and symbolizes Rabbi Weintraub’s desire to establish an intimate, human connection through Encounter. 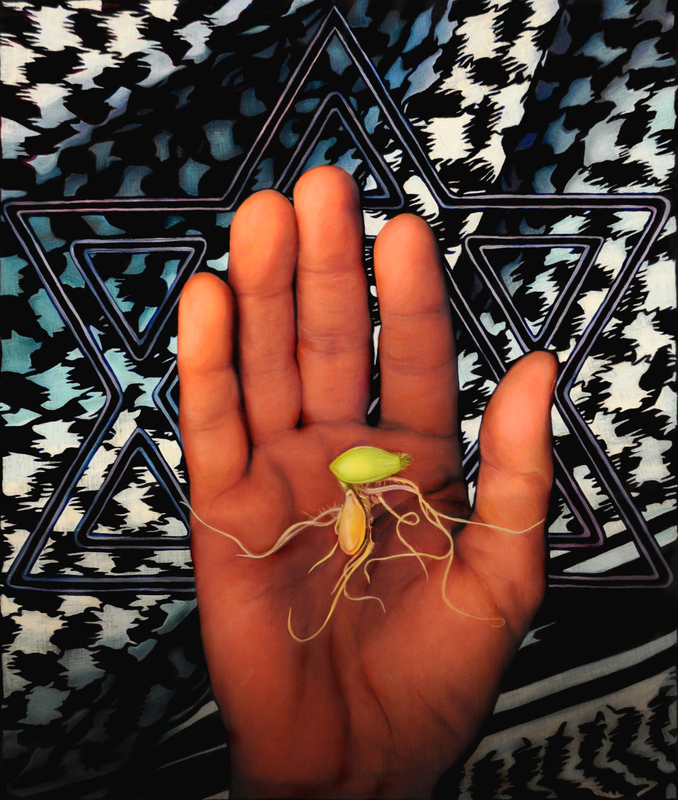 The seed of peace germinates within one person at a time, just as each American Jewish leader has a unique personal experience when participating in Encounter’s program.